The constant growth of the customers’ demands, the increase of the number of duties of wholesalers and retailers, the development of the legal system and globalization of the products’ delivery – these are the factors that have influenced the development of the unified standard that ensures food safety and quality. In addition, this solution will significantly save time for numerous inspections of retailers and suppliers. The IFS Certificate is unique for the companies in our branch in Ukraine. 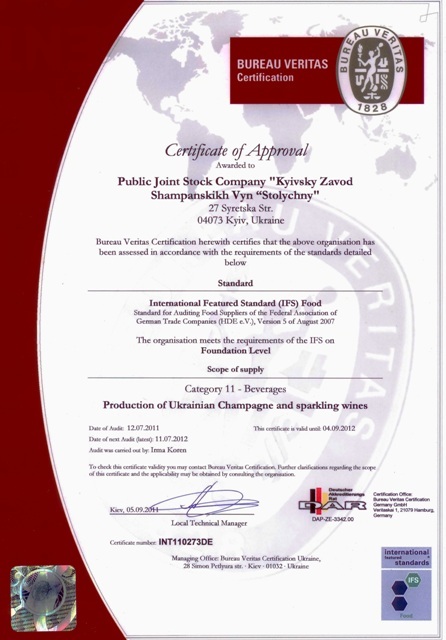 It confirms that the quality of the production of The Kyiv Factory of Sparkling Wines "Stolichny” meets all quality standards of the European Union and now the Kyiv sparkling wine can be sold in all retail chains of the Western Europe without any difficulties.